Large pizza about $7 for about 50 minutes work. 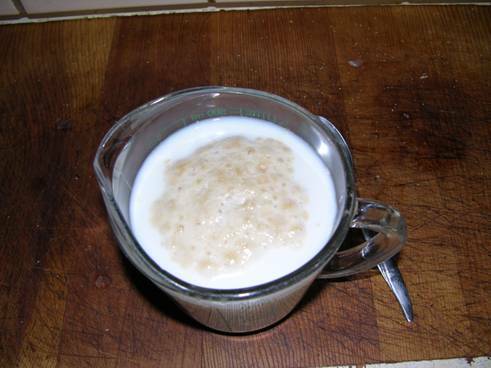 Water - 1 cup Milk - 1 cup Olive Oil - 2 tbs. Sugar - 1 tbs. Combine water, milk, olive oil, and sugar. Microwave 1 minute to make warm, but not hot. 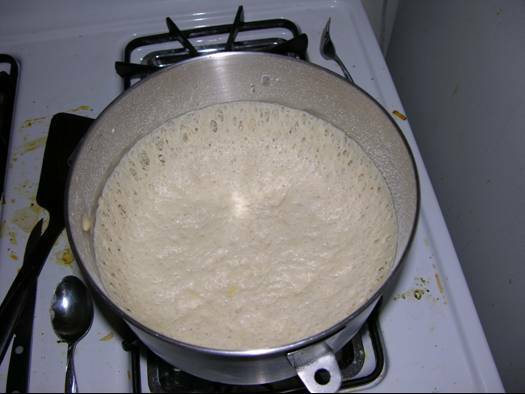 Allow yeast to activate and foam about 10 minutes, depending on the yeast you use. Mix flour into liquid ingredients 1 cup at a time until 4 cups have been added. Continue adding flour to dough a little at a time until the dough starts to pull away from the side of the mixing bowl (optionally, remove wet dough from the bowl and kneed on a floured surface by hand). Allow dough to rise in a warm place until at least doubled in size. I cover the mixing bowl with a kitchen towel and place in an oven that has been warmed on low for 3 minutes and with the oven light left on. 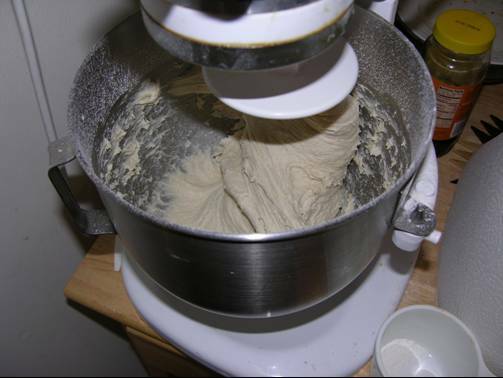 Use a large spoon to push the dough out of the bowl onto a floured surface. 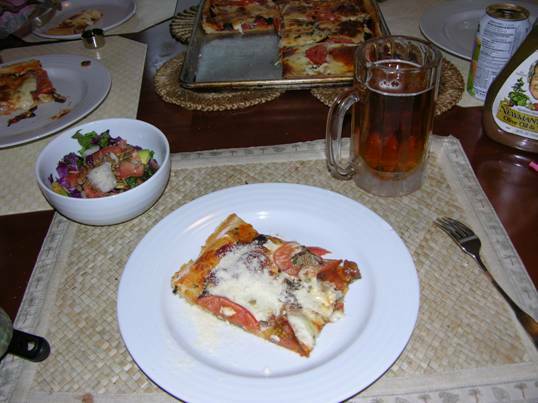 A large pizza can be made from 2/3 of the dough (I usually make a little loaf or bread sticks with the other 1/3). 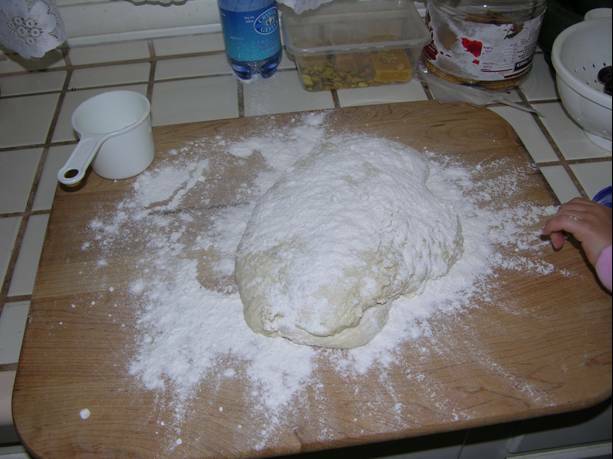 Use a roller to spread the dough out over the floured surface. My floured surface is a large cutting board. To transfer the crust to the cooking sheet I place the sheet face down on the spread dough, take it all outside and flip it over so the dough falls from the board to the cooking sheet. 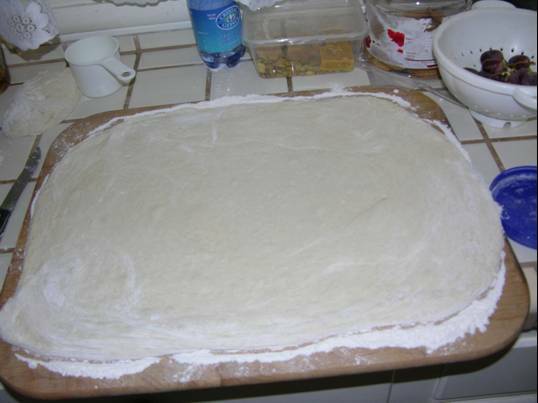 The dough can also be transferred by rolling it up on the rolling pin to lift it up from the board and roll it out onto the cooking sheet. Trim the excess dough from the edge of the sheet. Apply a coat of the olive oil to the dough surface. 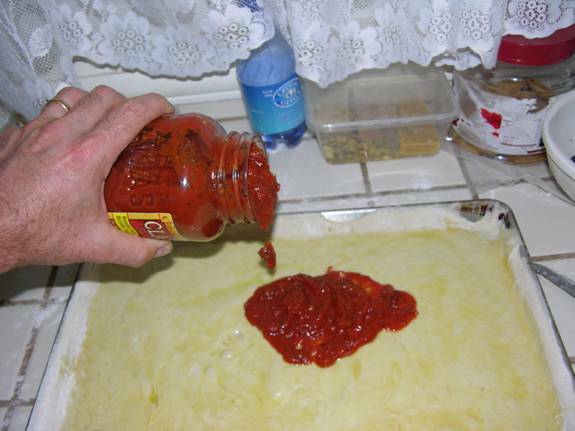 Apply a layer of the pasta sauce to the dough. 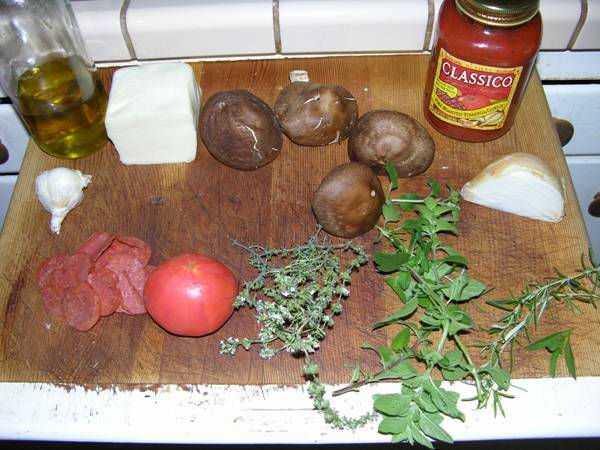 Add pepperoni (I microwave and blot off excess grease with a paper towel), sliced onion, sliced mushrooms, cut herbs, and sliced garlic. 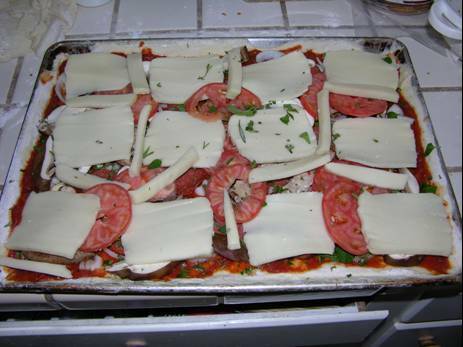 Add sliced mozzarella and sliced tomatoes. 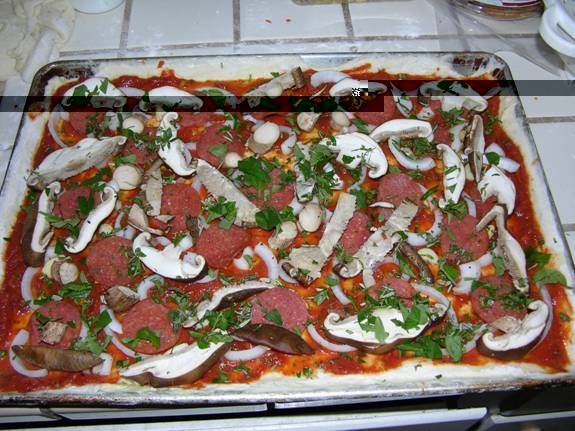 Bake at 375F for a little more than 25 minutes - until the edges are browned and the center of the pizza has started to bubble. 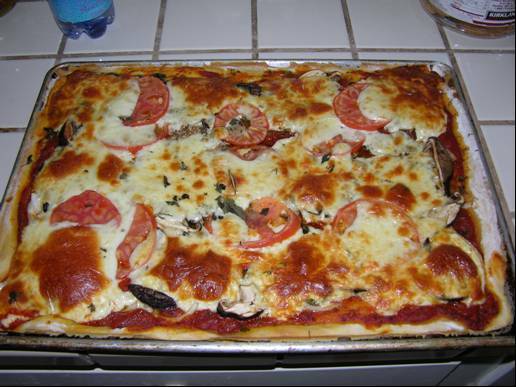 Remove the pizza from the oven and allow to cool 5 minutes before cutting and serving. 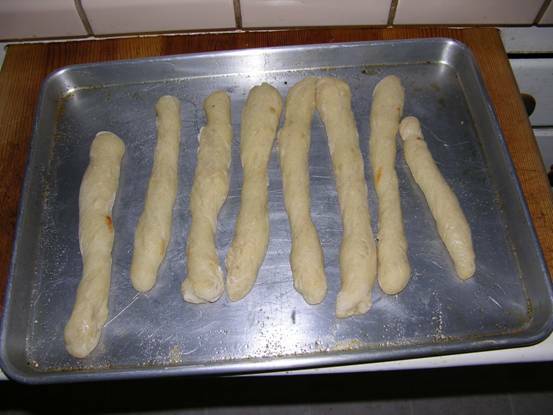 Excess dough can be rolled into sticks and baked about 12 minutes at 375F to make bread sticks. I butter and salt the sticks as they are removed from the oven. 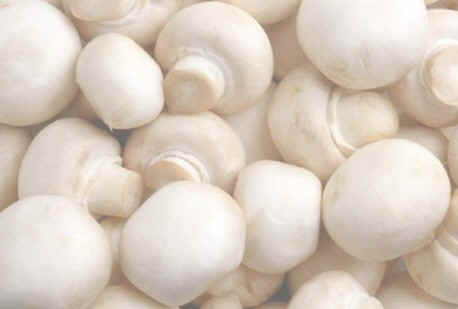 - Many people prefer a dryer crust. 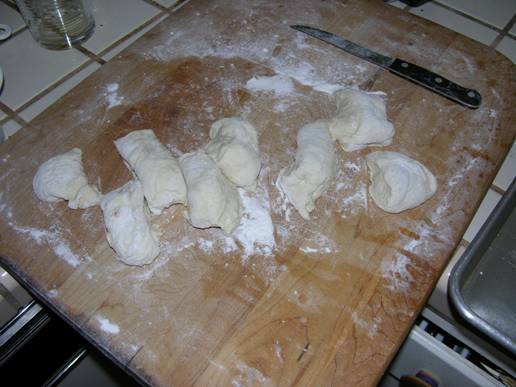 By adding more flour to the dough, it can be made stiffer and easier to kneed by hand. - The rolled dough I describe can be used to make cinnamon rolls by simply slathering with butter, covering with brown sugar, adding cut walnuts, adding raisins, and dusting with cinnamon. Roll, cross cut in 8 or 9 pieces and bake in a loaf pan.